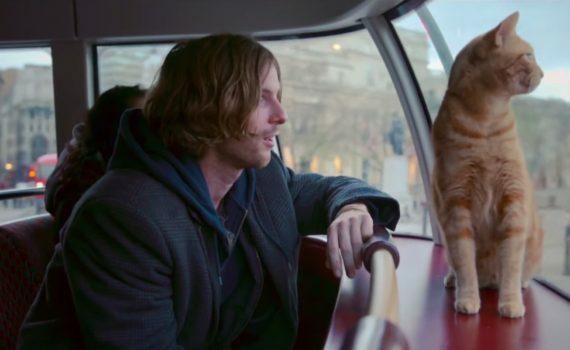 Based on the best selling novel, A Street Cat Named Bob is the story of an addict’s rise from the gutter with a helping hand from a special cat. Sounds like a Hallmark movie, and it is a bit, but the real life truth behind the plot gives it that extra little punch it needs to rise above Too Cheesy For Theatres status. This film is simply telling an uplifting story and cashing in on the book’s success, which there is absolutely nothing wrong with, especially given our own obvious desire to be fed cheese and to be promised that good triumphs over evil. Anyway, I don’t know whether I am too jaded to truly enjoy a movie like this or not, perhaps falling somewhere in the middle; you’ll have to judge for yourself just how much sap you can stand. James is a recovering drug user, a homeless adult, a busker, and a guy trying to survive an addiction that has followed him wherever he has roamed. On his very last chance, James is helped into an apartment in order to stay off the street, is nearing the end of his methadone treatment to stay sober. But it’s never easy to come completely clean, and just when things are looking down, something magical happens. A beautiful ginger cat visits James’ flat and then stays, becoming his constant companion. Busking with a cat on your shoulders attracts a lot of attention, and James’ life begins to show promise in a way it hasn’t in years. Bob the Cat is the friend James needed, coming at just the right time. Like I said, it’s sappy, but it’s also true. This guitar player/newspaper salesman was on the brink until an unusual companion helped save his life, and that can’t be underplayed. So sure, it’s a bit Hallmark, but it’s also nice to hear, nice to see that a young man can hold himself together with a little help from a friend. Bob the Cat plays himself in the film, and the actual James makes an appearance as well, so the whole thing feels very real and very honest. The movie isn’t very exciting, nothing too much happens, but you get the drift pretty fast and the rest is fairly enjoyable. Make up your own mind to how wide you can open your heart going in, but you just might be rewarded with a unique feel-good film.